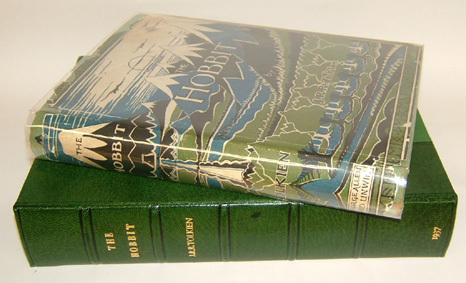 Ebay has become the major source for Tolkien collectibles as well as numerous other new and used items. The downside is that the availability of items has actually created a whole new group of collectors. This has increased demand and prices have shot dramatically upward. These websites are all searchable in a very detailed level. That means that you can input an author and/or a title, publication year, keywords, etc. and you'll receive a list of available items. When using any of these, remember that it's usually best to use as few keywords as possible. You can add keywords if the search returns too many results later on. Say you are looking for 'The Bulletin of the Modern Humanities Research Association', then you should just use Humanities Research in the title field, and Bulletin in the title to search within the previous results if there are to many items. Remember also that booksellers occasionally make typing errors. If you can't find the book you are looking for, eliminate either author or title and try searching on a single field (or try Tolkein,... this happens to the best booksellers). Don't be intimidated by the international sites. European booksellers are much more likely to be multilingual than North Americans. And almost all will ship anywhere in the world. Until today i never had any problems at all. My orders were handled swiftly, friendly and correct and books are always delivered as mentioned on the website. AbeBooks.com : It seems to have the biggest inventory and is the place to be when looking for scarce and even rare Tolkien books. Antiqbook: Based in the Netherlands, this database is broken into several sections: books before 1900, books after 1900, and maps & prints. A very good source for European titles. Probably the biggest European database. Over here you can also find good translations of Tolkiens work (Dutch, German, Swedisch, French,...) and not recent translations, but older work and even first editions. Bibliophile.net: A multilingual site, offering French, German, Italian, Spanish, and English language listings. You can register wants, and be emailed when a match occurs. Book Avenue: Allows you to save your wants, and be emailed when a match occurs. Has auctions as well. Tom Folio: owned cooperative database. Barnes & Noble: They are now offering out of print titles. They have not a very easy listing system, since you need to click a lot of times before being sure about which book they talk about exactly, but here you can find tons of scarce and even rare Tolkien books. Still, be ready to pay for them. They know their prices! Powell's Books : A bookstore in Portland, Oregon : well, actually, it's several bookstores. And cumulatively, they have a heckuva big inventory. There are some very good deals to be had. The interface is very clean, and you can search through everything from all of their stores, both new and used, as well as many markdown items. Keep in mind that they don't bother to describe the book's condition in their listings.